2 Yrs, 9 Mo, 3 d.
Anna’s tombstone is rather easy to spot. It is located in the middle of Zion’s cemetery and is the only tombstone in the cemetery with a figure of a lamb on the top. 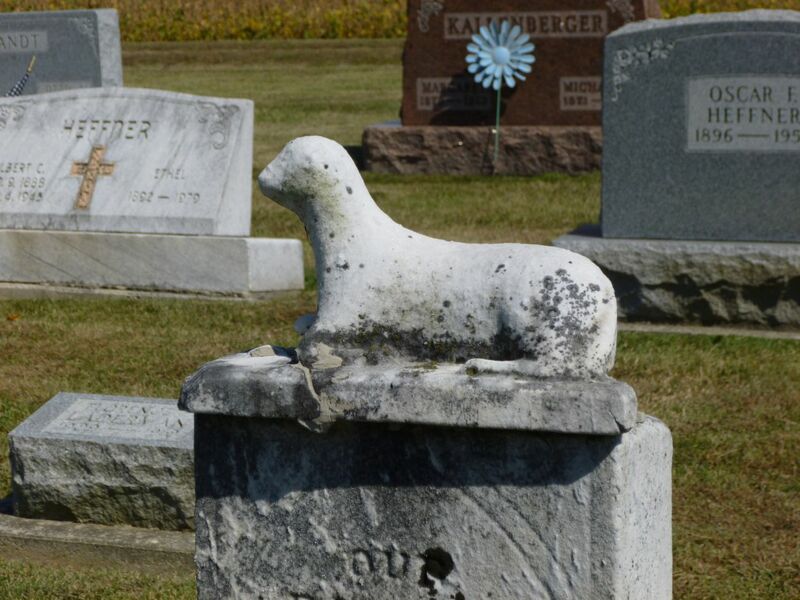 A lamb was most often used on a child’s tombstone and signifies innocence and purity. Markers with a lamb are not unusual but this is the only one in Zion Chatt’s cemetery. 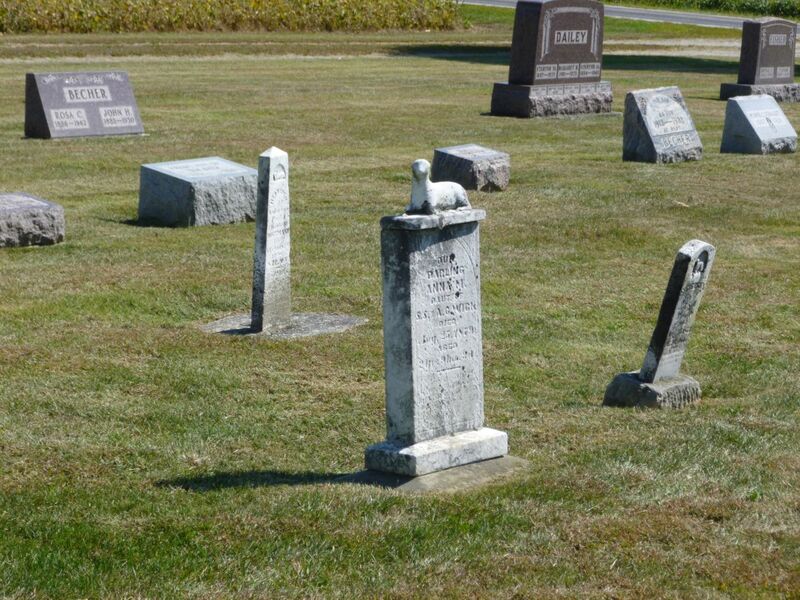 There are a couple tombstones with lambs carved into the stone in the cemetery. 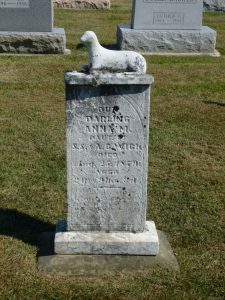 Christened Anna Magdalena Wick, Anna was born In Blackcreek Township, Mercer County, Ohio, on 22 November 1876, the daughter of Samuel Sixtus and Anna Catharine (Gugel) Wick. Anna was baptized when she was just 34 days old, on 26 December 1876. Her maternal grandparents, Sixtus and Magdalena (Herzog) Gugel, served as her baptismal sponsors. 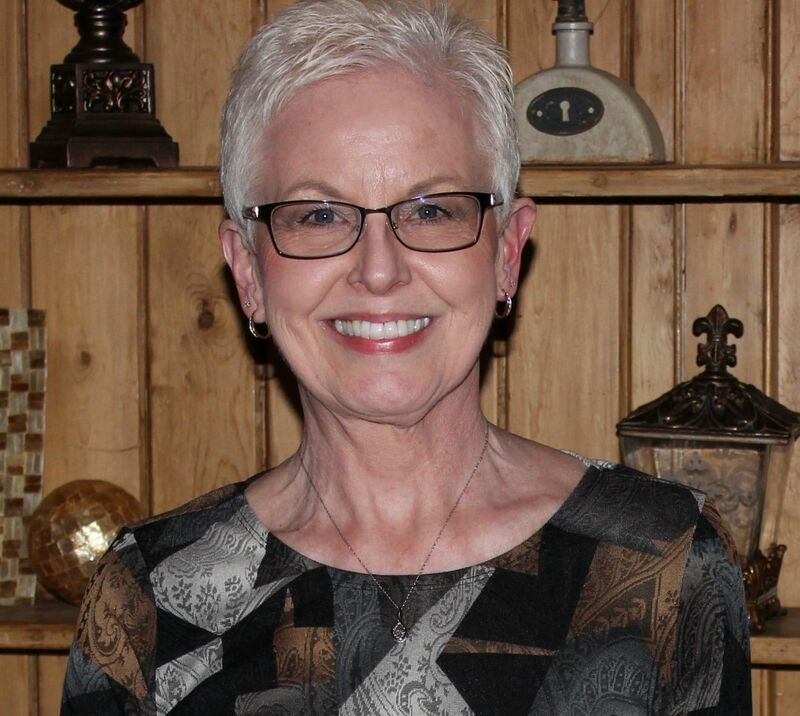 The records do not indicate whether she was baptized at home or at the church. Her birth is also recorded in the Mercer County Probate Court records, reported by her father. This surname was usually spelled as Wick in the church records but it was recorded as Wieck on Anna’s baptismal record as well as on her sister Maria Anna Wick’s baptismal record in 1878. The Gugel surname was sometimes spelled as Kugel. Anna’s parents, Samuel Wick and Anna Catharine Gugel married 6 April 1873 at Zion Chatt. Anna’s paternal grandparents were Johann and Anna Wick and her maternal grandparents were Sixtus and Magdalena Gugel. Anna Magdalena was born between two census enumerations so there are only few records that tell of her short life. Anna Magdalena died 25 August 1879, at the young age of age 2 years, 9 months, and 3 days. Anna’s father died in 1910 and her mother died in 1927. Both are buried in Duck Creek Cemetery. Her maternal Gugel grandparents are buried in Zion Chatt’s cemetery. When I looked at the 1900 census I noticed that the Samuel Wick family lived very close to my great-grandfather Jacob Miller and his family, which included my grandfather Carl Miller. The 1876, 1888, and 1900 Blackcreek plat maps indicate that Samuel Wick lived just around the corner from my great-grandfather. In 1876 Samuel owned 80 acres on the northwest corner of State Route 49 and Sipe Road. His father-in-law Sixtus Gugel lived across the road and also owned 80 acres. In 1888 and 1900 Samuel still owned his same 80 acre parcel as well as the 80 acres Sixtus Gugel had once owned. According to the map it looks like the Wicks lived in the house that Kralls once lived in. 1900 U.S. Census Black Creek, Mercer, Ohio, ED 74, p.10A, dwelling/ family 204, Samuel Wick; Ancestry.com (accessed 19 Mar 2017); FHL microfilm 1241303, NARA microfilm T623, roll 1303. “Ohio Deaths, 1908-1953,” FamilySearch.org (accessed 19 Mar 2017), John Sixtus Wick, 1 Oct 1945; FHL microfilm 2372585. Fred Wick: b. 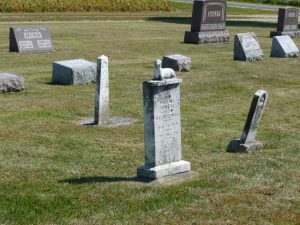 20 Jun 1880 MCO, died 4 Jul 1945: “Ohio Deaths, 1908-1953,” FamilySearch.org (accessed 19 Mar 2017), Fred Wick, 4 Jul 1945; FHL microfilm 2372580.